Nasth Sheir, the guitarist and vocalist of the band was my great penpal I ever had. We have been writting a letter since the late 90’s and sadly I still haven’t got a chance to meet with this cool guy. To me, The Kings Of Sarawak’s death metal will always be them. 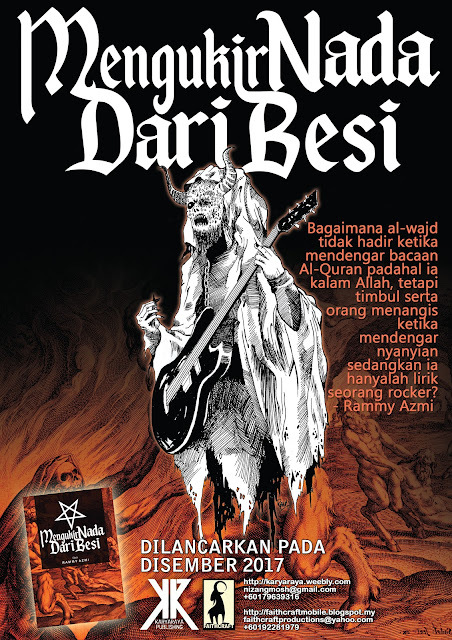 As they’re amongst the first in Borneo to worship Death/Black Metal beside Senseless, Unitheism, Larrong and few others. In 1999 with just a kidding, I offered to do the painting for their full length album after listening to their remakable debut EP. From my humble opinon, the EP cover that has been done by Nebiula Production crew didn’t fits well to their image as Sarawakian band. How come Rome-like broken idol can be match with death metal band from the Land Of Headhunter? So he give me the title of the album “The Curse Of Headhunter” for me to get an inspirations. He told me, he wanted something like Death’s “Human” album cover but with darker vision of death, tribal and symbolic. A few weeks later, the painting finished. And I posted it to his address. Nasth Sheir liked it and use it as their cover. 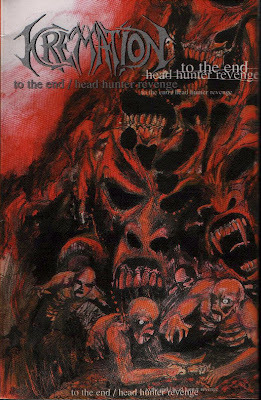 But the title has been change to “ Headhunter Revenge”. The album was released under Music Trax Sdn. Bhd. In 2000 but I got a free copy 1 year later. After keeps on asking for it. I guess, that is the way our local bands work. It is a bit dissapointment, to see this album only contained 5 new songs while the rest taken from their previous EP. They also recorded those new songs in Lelengau Digital Studio, but the result in Irama Studio in the EP is far much more better than Lelengau. Anyway, this piece is a must for you who still don’t know who the hell are Kremation! Recently, I heard Nasth Sheir fronted a Rock/Heavy Metal band called Rebellion which had released a few numbers of demo tapes. You might have to check that out for yourself.